A relocatable module is a piece of software which, when loaded into the machine acts as either an extension to the operating system or a replacement to an existing module in the operating system. Modules can contain programming languages or filing systems; they can be used to add new SWIs and * Commands. Relocatable modules run in an area of memory known as the Relocatable Module Area (RMA) which is maintained by RISC OS. They are 'relocatable' because they can be loaded at any particular location in memory. Their code must therefore be relocatable. RISC OS provides facilities for integrating modules in such a way that, to the user, they appear to be a full part of the system. For instance, the operating system responds to the *Help command, extracting automatically any relevant help text. Several SWIs and * Commands are provided by the operating system for handling modules, such as one to load a module file from the filing system. it is a desktop application - or part of one - which cannot be paged out (eg it has Econet control blocks active). Such programs must use RMA for workspace, and are hence easiest to write as modules. This chapter describes what is needed to write a module. This chapter is divided into two basic areas; using modules and writing them. All of the operations that a program is likely to need to operate with modules are in this SWI. You could treat the RMA as a kind of filing system, since there are commands to load things into it, remove them and run them. Some modules are supplied with the computer in ROM. These may be 'unplugged' and upgraded versions of them loaded into RMA. They may also be deliberately copied from ROM into RMA, since modules in RAM will execute significantly quicker than in ROM. There are a number of * Commands that replicate several OS_Module commands at a command line level. You can also obtain convenient lists of all modules currently in the RMA and the system ROM using a * Command. A module may be initialised more than once. This means that whilst only a single copy of the code is kept in memory, multiple copies of its workspace are created. The workspace is the area where all the data used by the module for dynamic storage is kept. Note that constant data, such as lookup tables is kept inside the main body of the module, with the code. Changing which workspace is used changes the context of the module and allows it to be used for several purposes concurrently. Each copy of the workspace, coupled with the code, is referred to as an instantiation. A module is deemed to be reincarnated when a new instantiation is created. Only a single copy of the code is needed because it is not changed by being used concurrently. The data is the only thing that provides the context for an initialised module. An example of the use of instantiations is in the module FileCore. This module provides a core of commands that are common to all filing systems with an ADFS structure, ie ADFS and RAMFS. It appears in one instantiation for each filing system that is using it. The core of all modules is the module header. It is a table of 11 entries, each a word in length. These are called by RISC OS to communicate with the module. Where to start executing in the module. This is used by languages and applications. Where to call initialisation code. This has to be called before all the others. Where to call finalisation code. This is called before removing the module. It allows the module to shutdown any hardware it is using and generally tidy up. A title for the module. A help string. This is used automatically by RISC OS when help is requested. Detailed help on * Commands. Entry points for * Commands. RISC OS will decode the * Commands and call the right entry point for a command for you. A table to convert to and from SWI names and numbers. Entry points for all the SWIs in the module. The chunk number for the module. This is the number that is the base for SWI numbers. There can be up to 64 SWIs in a module, all offsets from this chunk number. This is the only entry in the header that isn't an offset. Service call entry (see below). All communication from RISC OS to a module takes place through this table. As you can see, several features are used by RISC OS without you having to write code to deal with them, such as the help text, and SWI names to numbers conversion. Unknown command, OS_Byte, OS_Word, *Configure or *Status. *Help has been called. This allows you to replace this command when you detect a particular help call being made. Memory controller about to be remapped. This allows an application to stop a memory remapping if it doesn't want it to happen. Application is about to start. This allows a module to prevent an application from starting. With this, a module could prevent any other tasks running. Lookup file type. This converts the 3 byte file type into a string, such as 'BASIC' or 'Text'. Various international services, such as handling different alphabets and keyboards. The fast interrupt handler has been claimed/released. This is used by device drivers for high data rate devices that depend on the state of the fast interrupt system. An error has occurred. This is called before the error handler, but is only for module's information, not claiming. Reset is about to happen/has just happened. Filing system re-initialise. This is called when FileSwitch has been re-initialised and this is broadcast to all filing systems that use it to do the same. This is necessary, because otherwise a filing system could get out of sync with the context in FileSwitch. A screen mode change has occurred. This means that all modules can be aware of the screen state and re-read VDU variables, for instance. By monitoring these service calls, a module can be aware of many things that are occurring outside its control in the system. When RISC OS is started it automatically initialises all modules in the computer. In RISC OS 2 it does so in the order it finds modules, omitting any that are unplugged. The way in which the kernel initialises modules has been changed in later versions of RISC OS. If there is more than one version of the same module present in the main ROM, expansion cards or extension ROMs then only the newest version of the module is initialised, where newest means the version with the highest version number. If there are two copies of the same version, then directly executable versions (ie in main ROM or in a 32-bit wide extension ROM) are considered newer. If they are equal in this respect, then the later one in scanning order is considered to be newer. The kernel first scans all modules in ROM (whether they be in the system ROM, expansion cards or extension modules), building a list of modules and their version numbers. It uses this list to determine which is the newest version of a particular module. The kernel then scans down the list of modules in the system ROM. For each module in this list, the kernel initialises the newest version of that module. Hence if an expansion card or extension ROM contains a newer version of a module in the main ROM, the kernel initialises that newer version at the point where the main ROM version would have been initialised. This allows main ROM modules to be replaced without any problems associated with initialisation order. The kernel next scans down the list of modules in expansion cards. For each module in this list, the kernel initialises the newest version of that module, but with the hardware address (in R11) corresponding to that of the expansion card. If a module is present both in the main ROM and in an expansion card, the kernel therefore initialises the newest version of that module when scanning the main ROM (as above), and then reinitialises the same module when scanning the expansion cards. The kernel finally scans down the list of modules in extension ROMs. For each module in this list, the kernel checks that it is the newest version of that module, and that it has not already been initialised in lieu of a module in the main ROM or on an expansion card. If a module meets both these criteria the kernel initialises it. OS_Module is the main application interface to modules. In its description you will find a complete list of its calls, and details of each of them. A number of * Commands exist, most of which use OS_Module directly. 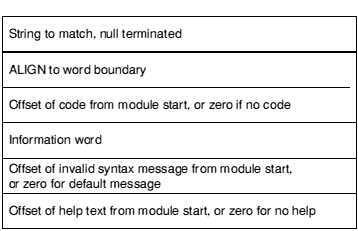 Below is a table summarising OS_Module entries and the *Command equivalent. Tidying - as mentioned above - refers to finalising all the modules, moving them together so that free RMA space is in a single block, and then re-initialising them. This solves problems with memory fragmentation. *RMEnsure is a command that will check that a given module and version number is loaded into memory, and will execute a specified command if it is not - such as loading a module from disc (which replaces the currently loaded version, if any), or generating an error. *Unplug will disable the ROM version of a given module. This is useful, for example, to save the RAM workspace claimed by a module you do not need to use. *RMInsert will reverse the action of *Unplug, without initialising any modules. The system works on the assumption that the private word is a pointer to workspace claimed in the RMA. It therefore provides suitable default actions on that basis. For example, when a module is killed the system will attempt to free any workspace claimed using this pointer, after it has called the finalisation code. Also, the system relocates the value held in a module's workspace pointer when the RMA is 'shuffled' as a result of an RMTidy call. Note that workspace allocated through XOS_Module will always lie on an address &xxxxxxx4. This enables code written for time-critical software (eg sound voice generators and FIQ handlers) to be aligned within the module body. If no error has been encountered, V must be clear, and appropriate registers preserved on exit. The above does not apply to application code within the module; this can follow any convention it wishes. The module indicates to the system if and where it wishes to be called by a module header. This contains offsets from the start of the module to code and information within the body of the module. All modules must have fields up to &18. However, any of these offsets can be zero, (which means don't use this entry since the module does not contain the relevant data/code), apart from the title string. This is the offset to the zero-terminated name and if it is zero, the module cannot be referenced. All code entries must be word aligned and inside the module code area, otherwise the checking performed by RISC OS will consider it invalid. All tables and strings must similarly be within the module or else it will be rejected. The SWI handler fields are optional and are only used if they contain valid values. The module header entries are described in detail in the following section of this chapter. Service calls are made from RISC OS to a module to indicate an occurrence of some kind. Some are claimable, and some are intended as broadcasts of the occurrence only. See the description in OS_ServiceCall for a complete list of all service calls. It is followed by details of each call. Some of these service calls will also be relevant to other parts of this manual that describe modules. For example, there are service calls that are provided explicitly to serve the International module. OS_Byte 143 is an obsolete way of calling OS_ServiceCall. It is documented, but must not be used, as it is here only for compatibility with earlier Acorn operating systems. Doesn't return unless error occurs. This is the offset to the code to call if the module is to be entered as the current application. An offset of zero implies that the module cannot be started up as an application, ie it is purely a service module and contains only a filing system or * Commands, etc. This field need not actually be an offset. If it cannot be interpreted as such, ie it is not a multiple of four, or any bits are set in the top byte, then calling this field will actually execute what is assumed to be an instruction at word 0 in the module. This allows applications to have a branch at this position and hence be run directly, eg for testing. Once entered, a module may get the command line using OS_GetEnv. Whenever the module is entered via this field, it becomes the preferred instantiation. Therefore R11 does not refer to the instantiation number. You must exit using OS_Exit, or by starting another application without setting up an exit handler. Start code is used by OS_Module with Run or Enter reason codes. R12 = pointer to private word for this instantiation of the module. If the private word 0, this implies reinitialisation after an OS_Module 8. This code is called when the module is loaded and also after the RMA has been tidied (OS_Module with Tidy reason code). The module will not be called via any other entry point until this entry point has been called. Thus the initialisation code is expected to set up enough information to make all other entry points safe. An offset of zero means that the module does not need any initialisation. The system does not provide any default actions. The Initialisation code is used by OS_Module with Run, Load, ReInit and Tidy reason codes. If the module is being re-entered after a OS_Module 'tidy', the private word may contain a non-zero value. This is the contents of the private word after the finalisation, relocated (if necessary) by the system. Typical actions are claiming workspace (via OS_Module) and storing the workspace pointer in the private word. Other actions may include linking onto vectors, declaring the module as a filing system, etc. During initialisation, your module is not on the active module list, and so you cannot call SWIs in your own SWI chunk. Instead you must directly enter your own code. You must not generate errors in your initialisation code. In particular, this means that you must call the error-returning (or 'X') form of SWIs, and must not call OS_GenerateError. For more details, see the chapter entitled Generating and handling errors. If your module is unable to function - perhaps because of an error returned from a SWI it called - it can refuse to be initialised by returning an error in the usual way (ie by setting the V flag, and returning with R0 as an error pointer). The system removes the module and any workspace pointed to by its private word from the RMA. Note that in this case it does not call your module's finalisation code. The module is also passed an 'environment string' pointer in R10 on initialisation. This points at any string passed after the module name given to the SWI. R11 indicates where the module has come from: if R11 = 0, then the module was loaded from the filing system or ROM or is already in memory; if R11 is > &03000000, then the module was loaded from an expansion card and R11 points at the synchronous base of the expansion card. Other values of R11 mean that the module is being reincarnated and there are <R11> other instantiations of the module. This is the reverse of initialisation. This code is called when the system is about to kill an instantiation of the module - either completely, or temporarily whilst it tidies the RMA. If the call is fatal, the module's workspace is freed, and the workspace pointer is set to zero. If the call is non-fatal (eg the call is due to a tidy operation), the workspace (and the pointer) will be relocated by the module handler, assuming they were allocated using OS_Module's 'claim' entry. R11 contains the dynamic instantiation number: ie the position of the instantiation in the instantiation list. This will not be the same as the R11 given to initialisation. Position in the chain can vary and the length of the instantiation list can also change. If the module generates an error on finalisation, then it remains in the RMA, and is assumed to still be initialised. The only way to remove the module from RMA in this state is by a hard reset. If the module has no finalisation entry, its workspace is freed automatically, if the pointer contains a non-zero value. Use link register given for normal exit. Set R0 and return with V set if refusing to die. The module is (possibly temporarily) 'de-linked' when called, so you can't, for example, execute SWIs that you recognise yourself. Used on OS_Module with ReInit, Delete, Tidy and Clear reason codes. Also when a module of the same name is loaded the old one is killed. Registers must not be corrupted unless they are returning values. This allows service calls to be recognised and acted upon. If the module does not wish to provide the service it should exit with R1 preserved. If it wishes to perform the service and to prevent other modules also performing it, it should set R1 to zero before returning, otherwise it should preserve the registers in order that other modules may have a chance to deal with the call. An offset of zero means that the module is not interested in any service calls. Some service calls can indicate an error condition by the contents of registers on exit (the V set convention cannot be used). Others, like unknown OS_Byte, can either claim the service, in which case there is no way of indicating an error, or ignore it, in which case an error will be given (if all modules ignore it). If you want to provide things like unknown OS_Bytes, and be able to generate an error for, say, invalid parameters, you should use the OS_Byte vector instead. Note that only R0 - R8 can be passed into a service call. The service call handler is used when a service call is issued or via an OS_Byte 143 or OS_ServiceCall. The service calls are described in the section on OS_ServiceCall. This is the offset of a null-terminated string which is used to refer to the module when OS_Module is called. The module name should be made up of alphanumeric characters and should not contain any spaces or control characters. This must be present for the module to be recognised. Module names which contain more than one word should follow the convention of the system modules, eg 'FileSwitch', 'SpriteUtils'. The case of the letters in a module name isn't significant for the purposes of matching. The string should be fairly short and descriptive, eg WindowManager or DiscToolkit. The string is used by OS_Module with reason codes Delete, Enter and ReInit, and also by the *Modules, *RMEnsure and *ROMModules commands. This is the offset of a null-terminated string printed out by *Help before any information from the module, eg *Help Modules, *Help Commands. It is advisable that this string is present to avoid confusion. The string must not contain any control characters (except Tab, which tabs to the next multiple of eight column, or character 31 which acts as a 'hard' space) but may contain spaces. The module name is followed by one or two Tab characters to make it appear sixteen characters long. The version number contains three digits and a full stop, eg '1.00'. The creation date is of the form 06 Jun 1987. This table contains a list of keywords with associated help text and, in the case of commands, an entry address to the command code. Other associated data provides information on the type of command, the limits on the number of parameters it can take, etc. It is used when OSCLI, *Status, *Configure and *Help wish to look for user-supplied keywords. The command can, therefore, accept between zero and 255 parameters. OSCLI counts parameters by starting at the start of the command tail and looking for items (quoted strings or continuous characters) separated by spaces. This is why it is advisable to use spaces as parameter separators and not commas, as in commands which are compatible with the BBC series of microcomputers. Byte 1 works as follows. Each bit corresponds to one parameter (bit zero of the byte equals the first parameter and so on). If the bit is set, the parameter is GSTrans'd before being passed on to the module. If the bit is clear, the parameter is passed directly to the module. This is useful for filing system commands which need to do filename transformations that are normally done by FileSwitch. Note: If byte 1 is such that the final parameter is GSTrans'd, the command tail passed to the module will have a trailing space. The match string is a filing system command and is therefore only matched after OSCLI has failed to find the command in any of the module tables as a 'normal' command. OSCLI only looks at filing system commands in the filing system currently active. Commands that need this flag set are, therefore, the filing system-specific ones such as *Bye, *Logon, etc. R0 = 0 *Configure has been issued with no option. The module prints a syntax string and returns. R0 = 1 *Status option has been issued. The module should print the currently configured status for this configuration option. Note that this facility duplicates two of the service code entries. You should use this method in preference, as the OS performs decoding of the option keywords for you. On return, if R0 is non-zero, it is assumed to point at a zero-terminated string to pretty-print (see below). Other flags should be zero for upwards compatibility. The invalid syntax message is used by OSCLI as the text of an error message. If the parameters, which are given, fall outside the range specified. If a zero offset is given, a default 'Invalid number of parameters' error is given instead. See also Service_SyntaxError on Service_SyntaxError (Service Call &8C). The help text is used by *Help. If a keyword in the *Help command tail matches the match string, then the help text is pretty-printed using the RISC OS internal token dictionary. Refer to OS_PrettyPrint for a full list of the token dictionary. A zero offset means no help text is to be printed. The string may contain carriage returns to force newlines. Tab (ASCII 9) is also a special character; it forces alignment to the next multiple of eight columns. Finally, ASCII 31 is a 'hard space', around which words lines will not be split. This offset contains the base of chunk numbers for the module. Note that it is the only offset that does not contain a pointer. RISC OS reads this offset to enable it to call the module when a SWI using its chunk range is issued. The TEQP instructions are not changing processor mode, but merely disabling IRQs in the current mode, so need not be followed by a no-op. are passed to the handler code. The module SWI chunk size is defined by the operating system to be &40 (64). For example, this entry in the Wimp module is &400C0, implying that it can accept SWIs in the range &400C0 - &400FF. code offset is a multiple of four with the top six bits zero. See the chapter entitled SWI numbers in detail for more details on SWI and chunk numbers. Note that the address calculation on the PC to jump to the appropriate branch instruction relies on there being exactly one instruction between the ADDLO and the B MySWI_0 instruction. Note that all the flags returned to the system are returned to the caller, so user's conditional code must be written with this in mind. Bit 17 in the given SWI number is not significant. The code is called on the assumption that it is the 'bit 17 set' version of the SWI. This means that the code must set R0 and return V set on encountering an error. Any error is then automatically dealt with by the system if the user actually asked for the 'bit 17 clear' version. In versions of RISC OS prior to 4.0, the SWI handler code is not passed the value of R9 specified by the caller. The RISC OS SWI despatcher corrupts R9 before calling a module's SWI handler code, and on exit from the handler restores R9 to the value specified by the caller. In RISC OS 4, the SWI despatcher passes R9 uncorrupted to and from the SWI handler code. When the SWIs OS_SWINumberFromString and OS_SWINumberToString are called, there are two ways that the conversion can occur. If the table pointed to by this offset contains the string for the required entry, then that is used. If it isn't there and the table pointer is 0, then the following offset is called, to allow the module code to perform the conversion. In this example, the chunk base number is &405C0. The SWI &405C1 would therefore be converted into 'Shell_Destroy' if passed to OS_SWINumberToString. The OS adds an 'X' if the SWI has bit 17 set, followed by the group prefix, followed by '_', then the individual SWI name. If the table does not contain enough entries, then the SWI name field is filled in by the offset from the chunk base (in decimal). If the table field is zero, then the code field is used (see below). This field is also used when converting from strings to numbers. This entry is used where a SWI name is not defined in the SWI decode table. If it cannot be decoded, and the table pointer is 0, then return with the registers unchanged and RISC OS will provide a suitable default. When converting from number to text, RISC OS will append a null at the position after the length you returned. This call is provided for compatibility with the BBC series of microcomputers, and is used for calling the modules' service entries. Only OS_ServiceCall should be used in new code. This call performs simple checks when deleting and moving modules. These actions give an error if the system 'thinks' you are applying them to a module currently active, for example, if you try to *RMKill BASIC from within BASIC. This check is applied whenever the system is about to call a module's finalise entry. Hence simple applications need not keep checks on this explicitly. More complex modules which, for example, run subtasks, need to keep their own state checks in order to avoid being removed when they are due to be returned to at some point. Many of the OS_Module calls refer to a module title. This has some general restrictions. The name passed is terminated by any control character or space and can be abbreviated with a full stop. For example, 'Eco.' is an abbreviation for 'Econet'. The title field in the module is similarly terminated by control characters and spaces. The pattern matching ignores the case of both strings, and allows any characters other than space or full stop. You should restrict your titles, however, to alphanumerics and '_' for future compatibility. As usual, errors are indicated by V being set and an error pointer in R0. These errors may be generated by one of the modules, and the error block addressed by R0 might reside in a module's code. You should therefore not rely on the error block remaining in the same place across calls to OS_Module. As the checks within this call cannot tell which instantiation of a module is active, no instantiation may die when one of them is the current application. The module name can also have an instantiation postfix. This consists of '%' followed by the instantiation name. This name field can be abbreviated in the same way as the module name. If no instantiation is given, the currently preferred instantiation is referenced. In the following pages, the reason codes for this command are fully explained. The details of general SWI operation are as per this description. This call is equivalent to loading, initialising, and then entering the module. If the module can be started as an application, it will be, and so the call will not return. Possible errors from RISC OS are 'File 'filename' not found', 'Not enough memory in module area' (or, under RISC OS 2, 'No room in RMA'), 'This is not a relocatable module'. The module itself may return errors such as 'Duplicate module refused to die', and 'Module refuses to initialise'. This reason code attempts to claim a block of the RMA and *Loads the file if it has the correct file type of &FFA. The header fields of the module are then checked for validity. If another module has the same name, it attempts to kill the duplicate module. This will give an error if the module refuses to die. Note that this allows system modules to be upgraded with new versions simply by loading the new version. All instantiations of the duplicate are killed. It sets the private workspace word to 0, calls the module through its initialise address and links it to the end of the module list, or replaces the old module of the same name. The module is initialised as instantiation 'Base'. The filename should be terminated suitably for OS_File. The terminator can be space, in which case there can be a parameter string after the filename to pass to the module initialisation. Possible errors are 'File 'filename' not found', 'Not enough memory in module area' (or, under RISC OS 2, 'No room in RMA'), 'This is not a relocatable module', and other errors dependent on the module, such as 'Duplicate module refused to die', and 'Module refuses to initialise'. If the module doesn't have a start address, then this call simply returns. If it does, this call resets the supervisor stack pointer to the top of the stack, sets user mode and enters the module, hence making it the current application. Any specified instantiation will become the preferred instantiation. The possible error is 'Module 'modulename' not found'. For a description of how a module is started up as an application, refer to OS_FSControl 2. This is equivalent to reloading the module. It is intended for use in forcing modules that have become confused into a sensible state, without having to reload them explicitly from the filing system. The instruction calls the module through its finalise address and deletes any workspace. It then calls it through its initialisation address to reinitialise it. If the module fails to initialise it is removed from the RMA. Possible errors are 'Module 'modulename' not found', and others dependent on the module. This calls the module through its finalise address, frees any workspace pointed at by the private word, delinks the module from the module list and frees the space it was occupying. Possible errors are 'Module not found' and others dependent on the module. This call returns information on the state of the RMA. It does this by calling OS_Heap with the appropriate descriptor. This calls the heap manager to claim workspace in the RMA. If it fails and application workspace is not currently being used then it will attempt to reallocate this memory and retry. It returns with V set if it is still unsuccessful. This call is useful for claiming workspace during the module's initialisation, but may also be used from other module entries. The possible error is 'Not enough memory in module area' (or, under RISC OS 2, 'No room in RMA'). This calls the heap manager to free a block of workspace claimed from the RMA. The possible error is 'Not a heap block'. This gives each instantiation of all modules in turn, from the end of the module list and working backwards, a non-fatal finalisation call. Instantiations of a particular module are killed in the order they appear on the current instantiation list. Should any instantiation of any module refuse to die, then any modules which have already been killed are re-initialised. Should any of these give an error during re-initialisation, they are then deleted from the system. The SWI then exits with the original error returned by the module that first refused to die. If all modules die successfully, this call then collects the RMA together into one large unfragmented block, and reinitialises the modules again. Any private words containing pointers to workspace blocks in the RMA are relocated. This should enlarge application space. This deals with each module in turn, removing it from the module list and calling it through its finalise address, if it isn't a ROM module. Errors are generated if modules fail to die. This takes a pointer to a block of memory and links it into the module chain, without moving it. Header fields are checked for validity. All duplicate modules are killed. If it is successful, then the module is called at its initialisation entry. Possible errors are 'Duplicate module refuses to die' and 'Module refuses to initialise'. The word immediately before the module start (ie at address R1-4) must contain the length of the module in bytes. This takes a pointer to a block of memory, and checks its header fields for validity. It then kills any duplicate module, copies the block into the RMA, initialises it and links it into the module chain. Possible errors are 'Duplicate module refuses to die', 'No room in RMA' and 'Module refuses to initialise'. This returns pointers to modules and the contents of their private word. It searches the list of modules to see if the module pointer given in R1 is valid. If it is valid, the next descriptor in the module chain is referenced, otherwise the first module descriptor is referenced. Information from the referenced descriptor is then returned. The information returned is exactly that printed by the *Modules command. Possible errors are 'No more modules' or 'No more incarnations of that module'. This allows modules to extend workspace blocks claimed in the RMA. It calls OS_Heap with the appropriate descriptor and attempts to enlarge the RMA if this fails. The possible error is 'No room in RMA'. This enables you to select the preferred instantiation of a particular module. This allows expansion card and extension ROM modules to be added to the module list. Note that extension ROMs are not supported in RISC OS 2. This returns pointers to modules and the contents of their private word. It searches the list of modules to see if the module pointer given in R1 is valid. If it is valid, the module descriptor is referenced. Information from the referenced descriptor is then returned. This call returns information on one module that is currently in ROM, along with its status. The module found is the given number of modules on from the start of the given ROM section. If there are insufficient modules in the ROM section then the search continues with the next section; so the fifth module in a four module section would in fact be the first module of the next section. The values returned in R0 - R2 are the correct ones to use this call to enumerate the next module; hence repeated calls will give a full enumeration of all ROM modules. The call returns the error 'No more modules' (error number &107) if there are no more modules from the point specified in the ordering. This call returns information on one module that is currently in ROM, along with its status. The call is identical to OS_Module 19, except that on exit R6 holds a BCD (binary coded decimal) form of the module's version number, as derived from the module's help string. The top 16 bits of this value hold the integer part of the version number, and the bottom 16 bits hold the fractional part: eg if the version number of the module is '3.14' then the value returned would be &00031400. The module found is the given number of modules on from the start of the given ROM section. If there are insufficient modules in the ROM section then the search continues with the next section; so the fifth module in a four module section would in fact be the first module of the next section. OS_ServiceCall is used to issue a service call. It can be used by any program (including a module) which wishes to pass a service around the current module list. For example, someone wishing to use FIQs might issue the claim/release service calls. A module may claim a service call by setting R1 to 0 on exit; this prevents the service call from being passed to any further modules. There are some service calls that you must not claim, since it is essential that all modules receive them; such cases are clearly documented. This service call is issued when a command is unknown. It is issued after OSCLI has searched modules, but before the filing system is called to try to *Run the command. It is also used to implement NetFS file server commands. If your module recognises the command, you should try to execute it, claiming the service call by setting R1 to 0 as usual. If the command was successful you should set R0 to 0 when claiming the call; if an error occurred you should instead set R0 to point to the error buffer. Note that this is the 'historical' way of dealing with unknown commands. You should, in preference, use the command string entry point. This call is issued after an error has occurred but before the error handler is called. It is included 'for your information', and must not be claimed. If the OS_Byte number is one used by your module, you should execute it and claim the call by setting R1 to zero. If you don't recognise the OS_Byte number, pass the call on by returning with the registers preserved. This method of adding OS_Byte calls is deprecated, and you should instead claim the ByteV software vector. See the chapter entitled Software vectors. If the OS_Word number is one used by the module it is passing through, you should execute it and claim the call by setting R1 to zero. If you don't recognise the OS_Word number, pass the call on by returning with the registers preserved. This method of adding OS_Word calls is deprecated, and you should instead claim the WordV software vector. See the chapter entitled Software vectors. This is issued at the start of *Help. You should claim this call only if you wish to replace *Help completely. The usual way for a module to provide help is through its help text table. If R0 = 0 on entry, you should print your *Configure syntax line(s), if any, and exit with registers preserved. If you don't recognise the command tail, you should exit with registers preserved. Note that it is also possible to trap unknown *Configure commands through the module's command table (see the chapter entitled Help and command keyword table) - which is the preferred method. Only one of these mechanisms should be used. If R0 = 0, you should list your status(es) and pass on the service call. If R0 0, then R0 is a pointer to the command tail. If you decode the command tail, and recognise it, you should print the associated information and claim the call. Otherwise you should not claim the call. Note that it is also possible to trap unknown *Status commands through the module's command table (see the chapter entitled Help and command keyword table) - which is the preferred method. Only one of these mechanisms should be used. This service is called when an application is about to start due to a *Go, *RMRun or *Run-type operation. If you don't want the application to start, you should claim the call, otherwise pass it on. This is issued on a reset, after all the ROM resident modules (including those on extension ROMs and expansion cards) have been initialised. This service call is issued just before a syntax error is returned from a module * Command. It is provided so that modules can localise their error messages for a particular territory. On entry, the registers hold sufficient information to identify the particular command being issued, and in which module it resides. If the service call is claimed, RISC OS outputs the returned error string in the block pointed to by R0; otherwise it uses the syntax error message in the module's help and command keyword table (see Help and command keyword table). This service call is only issued by RISC OS 3 (version 3.10) or later. *Modules displays information about all relocatable modules which are currently installed in the machine. The command displays the number allocated to each module, its position in memory, the address of its workspace, and its name. The number may change as other modules are installed and removed. The names listed by this command are the module titles, which are used as parameters for other commands such as *RMKill. *RMClear deactivates all relocatable modules in the module area, deletes them, and frees their workspace. Use this command only with extreme caution, as it is so drastic in its effects. ROM resident modules are not affected by *RMClear; if you wish to disable such a module, you should use *RMKill or *Unplug. *RMEnsure checks that a module is present and is the given version (or a more recent one). A command, optionally given as a third parameter, is executed if this is not the case, or - if none is specified - an error is generated. *RMEnsure is usually used in command scripts or programs to ensure that modules they need are loaded and of a recent enough version. *RMFaster makes a copy of a ROM resident relocatable module and places it in RAM. The module will run faster because RAM can be accessed faster than ROM. In doing so, the module is moved to the end of the module list. You should be aware that this can cause problems later; for example, the relative ordering of some modules is important to the *RMTidy command, which a number of applications use. *RMInsert reverses the action of a previous *Unplug command, but without reinitialising any modules. If no ROM section number is specified, then this command clears the unplug bit for all versions of the specified module present in the machine. *RMKill deactivates the preferred instantiation of a relocatable module (or the specified instantiation if the second argument is used) and releases its workspace. If the module is in RAM, it is also deleted. If it is ROM resident, it is made inactive until reinitialised by the *RMReInit command, or until the next hard reset. Use this command only with extreme caution, as it may be drastic in its effects. *RMLoad loads and initialises a relocatable module. It can then be accessed by the help system, and can provide SWIs and * Commands if available. The file must have file type &FFA, otherwise the module handler will refuse to load it. The optional initialisation string can be used to pass parameters to certain modules so they initialise themselves in a particular way. For example, you might use it to specify the amount of workspace that the module should claim, or a file that the module should load. *RMReInit reinitialises a relocatable module, reversing the action of any previous *RMKill or *Unplug command. The module is returned to the state it was in when it was loaded. Use this command only with extreme caution, as it may be drastic in its effects. If the specified module is active, then it is killed and then re-initialised. The optional initialisation string can be used to pass parameters to certain modules so they reinitialise themselves in a particular way. For example, you might use it to specify the amount of workspace that the module should claim, or a file that the module should load. The order of module initialisation is important in RISC OS. If a module relies on a second module being later initialised, you cannot successfully reinitialise the first module without then reinitialising the second. Under the desktop, a reinitialised module does not get restarted as a task unless you re-enter the desktop. *RMRun loads and initialises a relocatable module, and then runs it. The module is first loaded and initialised. (This is equivalent to a call to *RMLoad.) The module can then be accessed by the help system, and can provide SWIs and * Commands if available. The module is then run, if it can be. This is equivalent to an enter operation in OS_Module. Consequently, if the module cannot be run, then this command is equivalent to a *RMLoad command. *RMTidy collects together free space in the module area by moving and reinitialising all the modules it contains. The free space is gathered into a consecutive chunk of memory. Use this command only with extreme caution, as it is so drastic in its effects. *ROMModules displays information about all relocatable modules which are currently installed in ROM. System modules are stored in ROM, but may still be *RMKilled, *Unplugged, or replaced by RAM-based modules. You should use this command with caution, otherwise you may find programs stop working because you have unplugged a module that is essential to them. If no parameters are given, the unplugged ROM modules are listed.